I’ve recently decided to get fit again. Why now? I don’t know, I guess I have the urge to look better and feel better, plus my belly… Well, I won’t say too much about that. My diet has changed. I’m now eating mostly proteins, and some carbohydrates during the day. There is virtually no sugar in my diet. I’m hoping this is going to help me lose weight!! So basically, at the moment, for breakfast, I have freshly squeezed orange juice. I also have grapefruit. 2 to 3 hours later, I eat a piece of grilled chicken. I drink plenty of water in-between. I also eat a green apple if I get a chance. For lunch, I have a sandwich. This is with brown bread and grilled chicken or tuna.The sandwich also contains some salad, so things like cucumber, lettuce, tomato and onions. I try to drink plenty of water, and again a few hours later I’ll have some more chicken. Not too much. So between lunch and dinner I’m eating mostly fruit, and drinking water. In the evening, before going to the gym, I’ll have a banana to give me some energy. When I get to the gym, I’ll do some warm-up exercises, and this is then followed by a session in the gym. I was never a fan of going to the gym, but I’ve decided to have a go. There are different types of sports machines. It’s all new to me. My muscles do ache a little after doing a session. I suppose this is a good sign? On alternate days, I will also do an hour of aerobic exercises. This really makes me sweat. All of this exercise of course makes me hungry, and so when I get home, I have a ceaser’s salad (basically, lots of salad and chicken). I know I seem to be eating a lot of chicken, but I do vary this. I eat tuna if I can. So the current focus is on eating a lot of protein, eating relatively few carbohydrates, drinking lots of water and fresh juice, and eating as much fruit as I like. Where is this all going to end up? Well, time will tell. I’ll keep you posted! You can use this article as supplementary material if you like, as most EFL/ESL books have a unit related to health. All the best. After having taught in Saudi Arabia for around 8 years, it is only now that some aspects of what makes Saudi students ‘tick’ is making me re-think my preconceptions of why students struggle to write. 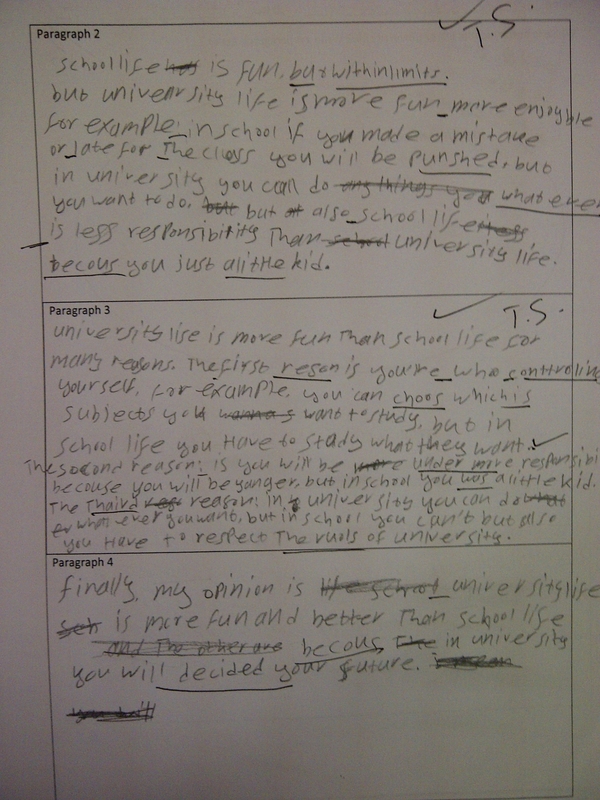 During a recent writing course I was teaching, the best student in the class made me aware that he and the other students had never been taught how to write paragraphs at school. “We were just told to write”. So that’s what they did – write. There were told “just to write”. This information is important, as what this brief piece of information reveals, is that students lack basic cognitive/thinking/learning skills, and that in the EFL classroom in addition to worrying about language, a great deal of time needs to be spent in just developing these more ‘lateral skills’. If anyone knows of any traits within Arabic writing that might help us understand the Arabic writing/thinking process, then could they please share their experiences? It’s not an Arab problem, it’s a Saudi problem. I say this, as all Arabs tend to be boxed into one category, but as experience shows, cultural and experiential factors play a significant part in how learning and language skills develop. We certainly need more research in this area.